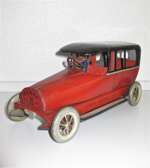 Large tinplate Limousine/ car from 1912 made by Carette or Karl Bub,Germany. Large limousine made by Carette or Karl Bub,Nürnberg ca. 1912.The car is with driver and to wind up.The rear door can to open. Drivers cabin separate. Driver lithograped with an "Eagle" Mark on his Jacket. Clockwork. Very good condition and working perfect. L=14 inch- 36 cm. See Peter Ottenheimer,Toy Autos,London 1987. 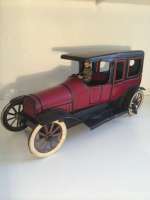 Note: Although this automobile is frequently identified as being manufactured by Karl Bub, David Pressland (Art of The Tin Toy), and (Toy Autos 1890 - 1939) indicates that it may have been produced by Carette since no pre-war Bub catalog exists. Greppert and Kelch car. Germany ca 1920. Terra. 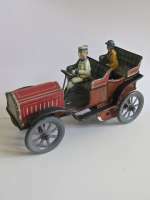 tin plate car made by Lehmann, Germany.EPL no.720. 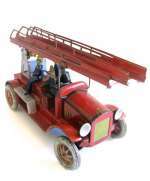 Wind up car with driver from Lehmann, Brandenburg. The car is the older version with wire wheels. Working excellent. Good condition,but some wear on the radiator cover. L= 10 1/4 inch- 25 cm.See Heike Köhler og Katharina Kreschel,Von Störischer Esel zum Kletteraffen Tom.Brandenburger Museumshefte 6,Brandenburg an der Havel 2007. Jürgen & Marianne Clieslik,Ein Jahrhundert Blechspielzeug,München 1981. Helmut Schwarz og Marion Faber,Moving Times,Ernst Paul Lehmann Patentwerk,,History on a Toy Factory,Toy Museum Nürnberg 2003. 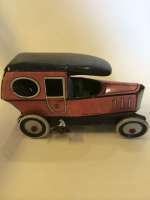 Antique tin toy open tourer. Germany 1920. Great German open tourer with clockwork. Lithographed in fine colours with fine details.Interesting are the two figures: a driver and a lady passenger. Wonderful colours. Very good condition. 1920. Size: L 6"/ 15 cm. This tin plate toy is working with clockwork. Zeppelin " Chicago". Firma Strauss. Made for USA in the 20es. A rare piece. Good Condition, Celluloid prop blades. All Original. Works well. Airship. Wind up Toys. L= 9 inch-23 cm. Galop.Racing car and garage made by Lehmann Brandenburg between 1927 and 1940.The car is a wind up car with a driver. Working perfect.EPL # 760.L= 5 1/2 inch-14 cm.The garage has EPL #771 and L=6 1/4 inch.- 16 cm. Both the car and the garage are in a very good condition-near mint. Literatur: Heike Köhler und Katharina Kreschel: Vom störrischen Esel zum Kletteraffen Tom. Brandenburger Museumshefte 6, Brandenburg an der Havel 2007. Jürgen & Marianne Clieslik: Ein Jahrhundert Blechspielzeug, München 1981. Helmut Schwarz und Marion Faber: Bewegte Zeiten\Moving Times - Ernst Paul Lehmann Patentwerk. Geschichte einer Spielwarenfabrik/History on a Toy Factory, Hrsg. Museen der Stadt Nürnberg 2003.